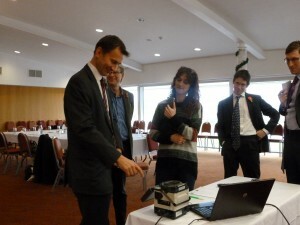 Jeremy Hunt, the Secretary of State for Culture, Media and Sport –and the Minister in charge of broadband – was in Penrith yesterday where he met some of Eden’s Broadband Champions. Best of all, he ‘virtually’ opened Warcop’s Cyberbarn by fusing together a fibre-optic cable (with some help from Lindsey Annison!). Cyberbarn, Warcop and Bleatarn, is open on Mondays, Wednesdays and Friday between 1 and 7pm. Fibre, 3G And satellite technologies are on show. UK Online Basics course are available on everything from email to online safety, DEFRA to CTS, social media to computer programming. This entry was posted in Uncategorized on November 10, 2011 by Admin. Once ignored by telecom companies, Cumbria is now one of the pilot areas for the government's superfast broadband programme. Speak up for your community's needs.